Leading Mexican rental and technical production company Meridian Pro S.A de C.V based in Iztapalapa in the east of Mexico City has expanded its lighting stock with the addition of 14 Robe Pointe moving lights. Meridian is the second Mexican rental operation to invest in Pointes, which will be used for all types of events and concerts across the country. CEO Germán Sevillano Sánchez explains that these first 14 Pointes – Meridian is expected to invest in more in the near future – will be used on the new 35 date Mexican leg of popular rock band Zoe’s world tour. The band is promoting their new album “Prográmaton” and Meridian is providing full technical production, lighting, sound and video for the Mexican shows. “The Pointe is a highly innovative product and we wanted to use it for the new Zoe show,” he says, extremely proud of his first investment in Robe. Germán, who has 22 years’ experience in the professional production industry, made the decision to buy Pointes - the company’s first Robe products - after seeing a video of the Pointe on Robe’s web site and social media channels. “I immediately thought the product looked amazing,” he says. Next he saw a live demo from Robe’s Mexican distributor Vari Internacional at the 2013 Sound.check Expo, which confirmed his initial thoughts on the fixtures and the order was placed soon after. Zoe’s lighting designer Iván “Chaka” Escutia, jumped at the possibility of using the Pointe for the Mexican tour. “It’s hugely impressive,” he said when Germán showed him the fixture in action. Rehearsals for this will start in January 2014, and the first show in the country will be on January 17th at the Plaza de Toros Lienzo Charro in Pachuca de Soto. The tour is currently scheduled to play about 100 gigs worldwide and has already started in the USA with equipment sourced locally through different providers. 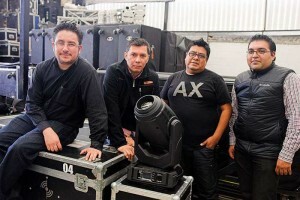 Meridian Pro was founded nine years ago originally as an audio company, but due to the increased number of concerts, shows and events in Mexico they decided to incorporate video, lighting, rigging and other technical disciplines in order to provide a complete production solution for their clients. In picture; Bruno Carranza (Vari), Germán Sevillano Sánchez (Meridian Pro), José Luis Pérez López (Meridian Pro) and José Alberto García Ramírez (Vari).